Edinburgh’s cultural and historical attractions make it a favourite destination of both local and international tourists. It’s a great city with colourful festivals, food lovers’ dream destinations, numerous secret gardens, and fascinating stories of the land in each bend and corner. It’s a fabulous city made even more meaningful by its dog-friendly places that you can easily bring your four-legged furry friend for a day or two that’s worth remembering. And if you’re entertaining the idea of visiting Edinburgh with your canine pal, then you’ve got to put in your list of things to do these 10 best places to walk your dog in Edinburgh. This has got to be the most popular place for both dog lovers and their furry pals. Pet parents can easily take their time off basking in the sun and enjoying the surf while their dogs can spend all of their pent-up energies and be as wild as they could possibly get. The combination of fresh air from the sea and the stunning view of the water is often enough to make you forget your worries. Because of its popularity among man’s best friend, grab your dog harness and bring your dog to Portobello Beach only opens up more friendships for your hound. It is these memories that will make you want to bring your dog back to Portobello. Standing tall and proud at 251 metres, Arthur’s Seat is one of Edinburgh’s iconic landmarks. It is a dormant volcano that has become one of the favourite places of Edinburgh dog walkers. The stunning view of the city is often enough to make you forget your worries while the vast expanse of greens is sure to make the day of any canine breed. There are a variety of routes on the Arthur’s Seat, from a gruelling 1-hour hike that will test both you and your hound’s endurance to a 15-minute leisurely stroll towards the peak. Upon entering this 85-acre estate that was once privately-owned, you and your pet will be greeted by a lodge house that now serves as the Estate’s visitor centre. This is also the perfect place where you can start on your dog walking activity, taking in as much of the beautiful scenery of the once-renowned estate. It’s a relatively short walk, but made timeless by the impressive grounds plus the majestic stance of the Cammo Tower. It is like walking in the countryside where the only thing that will remind you that this is still part of the city of Edinburgh is the occasional crossing of paths of other visitors. Smack right in the middle of the city is The Meadows, a very popular destination for both locals and guests. 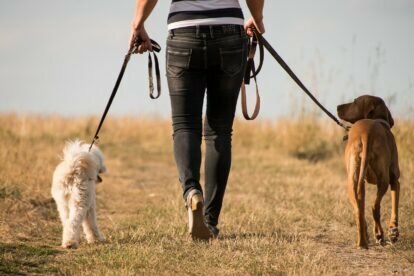 It is the perfect place to take and walk your dog if your primary intention is to have it socialize with other people and perhaps even other dogs. The large grassy areas and expansive playing fields are gigantic playgrounds for people and their furry friends. There are university buildings nearby, making The Meadows a favourite hangout for students during breaks. And when you visit in June, your dog will surely love the dog show during The Meadows Festival. Whether it is scrublands, woodlands, or grasslands that you’d want to walk your dog on, The Hermitage of Braid has it for you. The woodland is always a favourite since it houses some of the city’s oldest trees. This is a lovely park that has been classified by the city as one of its local nature reserves. With picturesque views, occasionally graced by the park’s native residents such as green woodpeckers, kingfishers, kestrels, and herons, a stroll on the plentiful paths and trails on the Hermitage should give you and your dog just the kind of breather you need from your otherwise mundane existence. Located at Edinburgh’s northern end and just beside the equally historic and stunning Royal Botanic Gardens, Inverleith Park beckons for dog lovers to take a walk on its greens-blanketed landscape. Described as Edinburgh’s oasis of green, Inverleith offers some of the best views of the city primarily because of its strategic advantage on high ground. Take your dog for a stroll along paths that are guarded by lush trees on both sides. Play a game of fetch on the various pitches right within the park. You can also sit by the pond while watching the swans do their graceful dance above the water. Part of Edinburgh’s UNESCO World Heritage Site, Calton Hill is best known for its National Monument – an unfinished building that was initiated a year after Napoleon’s defeat at Waterloo. The designers of the ‘monument’ wanted to create the city’s own version of the Greek Parthenon. Unfortunately, the project was plagued with budget constraints that it was subsequently abandoned. Today, the building is colloquially called ‘Edinburgh’s Shame’. Regardless, it is still an impressive site complete with grass-covered, gently rolling slopes. It is, thus, one of the best places to bring your dog where you can actually walk it off-leash since it is not near any of the city’s main roads. It is always said that the best place to appreciate Edinburgh is from a high vantage point. Blackford Hill suits that bill perfectly, allowing you to enjoy a sweeping view of the city. However, being located atop a hill, getting to the top should be your priority. The good news is that the climb is not really that arduous. Even toddlers can easily tackle the climb. With your dog, it should be a cinch getting to the top. It’s also a great way to bond with your furry pal as you make your way to the peak and be greeted with the best views of the city. Every day, Edinburgh commuters pass by this park that is conveniently nestled on the city’s southern end. Little do they know that the park is actually a beautiful little valley that is best appreciated when one walks on its verdant grounds. It may not be as huge as other parks, measuring only 11 hectares, but it sure is enough to allow your dog to roam as freely as it wants. The grounds are secure so your hound can do all the exploring that will satiate its natural curiosity. There are benches along the paved paths, allowing you to take it easy while your dog does its thing. If you’re into Scottish wildlife, then Colinton Dell is the best place to visit together with your pet dog. It’s a steep-sided gorge that is well-protected from the harshest elements, making it a safe haven for birds, amphibians, stoats, voles, and even roe deer. It used to be a small village, but Colinton is now part of the great Edinburgh expansion. The area covers some 25 acres of ancient woodland, perfect for taking your dog for a blissful walk. Parks in Edinbugh are great for dogs. The wooded parks are well-maintained, making them ideal for walks with your dog. You can practically bring your pet everywhere. There is no doubt that Scotland’s capital city is one of the top dog-friendly cities in the United Kingdom.